The Center for Leadership Innovation and Mentorship Building at California State University, San Marcos holds "In the Executive's Chair," a course where students hear from business leaders in an extensive panel discussion and Q&A session. The Daily Transcript has partnered with CSUSM to cover these discussions in print and online. If the golf industry were an economic indicator, analysts would have a reason to celebrate. But Mike King, the chief executive of Carlsbad-based TaylorMade, said he isn’t hailing the end of the recession just yet. On Thursday, Qualcomm Inc. founder Dr. Irwin Jacobs gave business students a perspective they don't always get: hindsight. In 2003, the ceiling almost caved in on Jazzercise -- literally. For someone who always wanted to work in sports, Jeff Moorad’s career has been a success by most measures. But he said he still has one goal he’d like to achieve. Leadership in hard times is more difficult because of the continual stream of bad news, Cal State San Marcos President Karen Haynes told students Tuesday during the “In the Executive’s Chair” class. Leaders are forced to communicate messages that most people are unhappy about, Haynes said. Like every other industry, hospitality has taken a hit in this economy. It’s not uncommon for college seniors to not have a plan after graduation day. The classes of 2009 and 2010, in particular, are expected to have a difficult time finding work as the economy has soured and most companies are not hiring. Bill Strauss wasn’t a great student, and certainly didn’t have an innate knowledge of flowers, but he’s still been able to turn Pro-Flowers, a company he helped found, into a $400 million business. Over the course of his business career, Bill Lofft has learned from whom to accept advice, how to build a company culture and how business people choose to travel. Such lessons have been useful in establishing Zuum Craft, a North County start-up that offers innovative short-range electric scooters. Bill Hixon's varied background gave him the necessary tools to begin his new entrepreneurial endeavor: a yet-to-be-named company that will create a computer program to help students learn math at their own pace. While many small company-CEOs dream of expanding across the nation, Stone Brewing Co.’s Greg Koch, wants the opposite. It’s not always easy being the only man in a house with a half-dozen women, but Scripps Green Hospital Chief Executive Robin Brown told California State University, San Marcos students that the experience has taught him a lot about communication and empathy. In 1976, Phil Blair was expecting his first child and his best friend, Mel Katz, was engaged and going to be married in a few months. Both Blair’s wife and Katz’s fiancé expected to stay in Phoenix, where their men worked as fashion buyers for a local department store. One of the most recognizable brands in the action sports industry began in 1997 with $50,000, a business plan and an idea to showcase a product the surf/skate/snow industry hadn’t really focused on before: watches. It was never a part of Gerry Krippner’s plan to take over the family business, but 25 years after graduating with a bachelor's degree in mechanical engineering, he sat in front of a group of California State University, San Marcos students to discuss what it is like to be the CEO of a company founded by his father and co-owned by his brothers. He’s an engineer who got his MBA in business from Harvard and a father of three who enjoys skiing, weightlifting and playing in his over-35 two-hand-touch football league. George Hage, the chief executive officer of the security company HiTron, said that in the next few years, people should get used to being on camera a lot more often, and he wasn’t making a reference to YouTube. Maureen Gray doesn’t feel like she needs to worry about a glass ceiling. Do what you are passionate about, and never waiver on your vision. The wine business in Germany is steeped in traditions that are thousands of years old. Change is viewed as completely unnecessary. It took a strict nun to nudge Michael Covert into medical administration nearly 40 years ago. When eight out of 10 households use your product and 95 percent of the country’s population is familiar with it, where does a company go? A professional motorcycle racer and investment banker on Wall Street, President of BikeBandit.com Ken Wahlster said his financial experience helped him be successful more than his time in the Grand Prix. Cloud 9 Super Shuttle’s logo may look whimsical and not like an airport shuttle service, but that’s exactly what company President John Hawkins wants you to think. Managers may not be able to increase productivity by giving their employees serotonin -- well, legally -- but they can boost production by making the work area a little more brain-friendly. Jim Tenuto, president and CEO of Renaissance Executive Forums, is following his passions. For Hitron President and CEO George Hage, life isn’t about age -- rather it is how one feels about life. With a new book slated to hit the shelves and a energetic attitude that exudes determination, Consultant and CEO of The Human Factor Holly Green is all about success. As the president and chief operating officer of Submarina: California Subs, Mimi Zeller is focusing on balancing her personal and work life -- while taking the franchise from 60 to 1,500 stores. To find an input team with a quality staff was the advice Sempra Energy President Neal Schmale offered to students at California State University, San Marcos on Wednesday. It takes one to know one -- and Ron Gerevas knows what is takes to be a CEO. Even after a 25-year career at one of the Big Four accounting firms, Helen Adams has found ways to keep life stimulating. Just over a decade after launching a brand of watches, Andy Laats continues to be fueled by the company’s continuous development. There was no blueprint or business plan, just simple steps leading to an international franchise. Greg Koch brews and sells beer. He doesn’t advertise though -- and he doesn’t care if you don’t like his beer. He knows that only 3 percent of the world likes specialty beer, and he wants that 3 percent to enjoy his brews at Stone Brewing Co.
Joseph Lutz closed out the semester on Wednesday during the "In the Executive's Chair" course at California State University, San Marcos. While educational and life experiences are most often applied to career development, panelists at California State University, San Marcos on Wednesday showed there is a specific correlation between military knowledge and business leadership. There was not a road map Drew Senyei followed to alter his career from being an obstetrician to becoming a venture capitalist. David Hale is known as either a serial entrepreneur or, to some, as the “Godfather of biotech” due to his history of founding and developing more than 15 biotechnology and specialty pharmaceutical companies in San Diego County. A combination of networking and passion has guided Barbara Bry to a variety of fields in her career. Ralph Rubio turned his appetite for Baja California’s fish tacos into a restaurant chain 25 years ago. A familiar business venture -– quality and affordable educational course packets -– became a thriving company for a young entrepreneur. California State University, San Marcos, students recently gained insight into a company’s upcoming merger, learned about different company cultures and ethical dilemmas encountered from a senior-level executive. “You’re going to have the 'King of the Whoppers' in here soon,” Professor David Bennett said to a room of laughing upperclassmen. April 29, 2010 -- Mark King, president and CEO of TaylorMade Golf, speaks to students at California State University, San Marcos. April 29, 2010 -- Reporter Elizabeth Malloy talks with TaylorMade Golf President and CEO Mark King after his class discussion at California State University, San Marcos. April 7, 2010 -- Dr. Irwin Jacobs, founder of Qualcomm Inc., speaks to students at California State University, San Marcos. April 8, 2010 - Reporter Elizabeth Malloy sits down with Qualcomm Inc. founder Dr. Irwin Jacobs after his class discussion at California State University, San Marcos. Feb. 11, 2010 -- Judi Sheppard Missett, CEO and founder of Jazzercise, speaks to students at California State University, San Marcos. Feb. 11, 2010 - Reporter Elizabeth Malloy sits down with Jazzercise founder and CEO Judi Sheppard Missett after her class discussion at Cal State San Marcos. Jan. 28, 2010 -- Jeff Moorad, CEO and lead owner of the San Diego Padres, speaks to students at California State University, San Marcos. 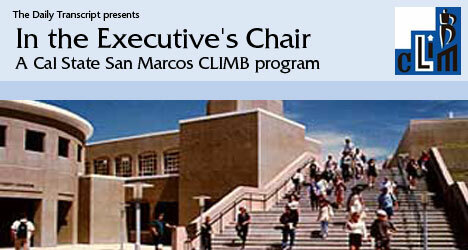 Dec. 1, 2009 -- Dr. Karen Haynes, president of California State University, San Marcos, speaks to students about leadership in hard times.